King Solomon was wealthy and wise beyond measure. He could-and did-have anything he wanted, including many women from many lands. But for all his wisdom, did he or the women in his life ever find what they searched for all of their lives? In this engrossing novel, you'll find yourself whisked away to ancient Israel, where you'll meet Solomon and four of the women he loved: Naamah the desert princess, Abishag the shepherdess, Siti the daughter of a pharaoh, and Nicaula the queen of Sheba. As you experience the world of Solomon through his eyes and the eyes of these women, you'll ask yourself the ultimate question: Did Solomon's wisdom ultimately benefit him and those he loved or did it betray them? Jill Eileen Smith is the bestselling and award-winning author of the biblical fiction series The Wives of King David, Wives of the Patriarchs, and Daughters of the Promised Land, as well as the nonfiction book When Life Doesn't Match Your Dreams. Her research into the lives of biblical women has taken her from the Bible to Israel, and she particularly enjoys learning how women lived in Old Testament times. Jill lives with her family in southeast Michigan. Learn more at www.jilleileensmith.com. 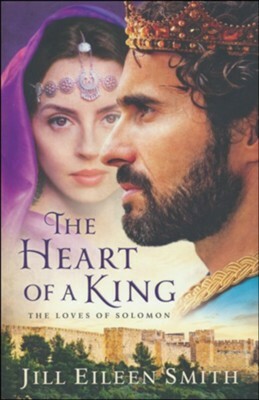 I'm the author/artist and I want to review The Heart of a King: The Loves of Solomon.